You can feel it in the air... the change of temperature, the smell of wet earth and the sound of crispy fallen leaves on the ground. Fall is here and will soon give way to winter's grip. How crazy cute is this?! Now I can't knit to save my life so I decided to sew something similar to this. Thus, my hoodie scarf was born! After a few tries and some researching, I came up with a very simple pattern that is easy and quick to assemble. 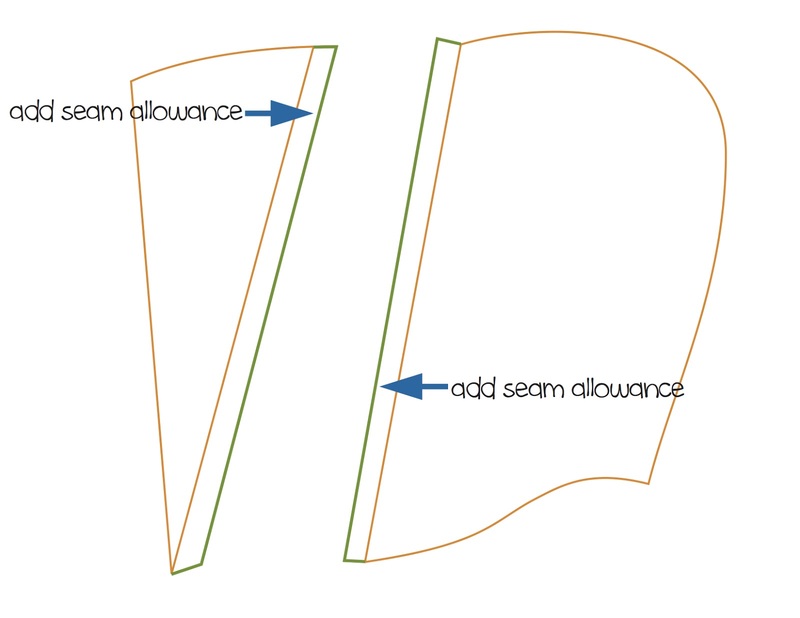 Here is a diagram of the pieces for your hoodie pattern (not including the scarf). To make the hoodie pattern, take your child's hoodie and trace. 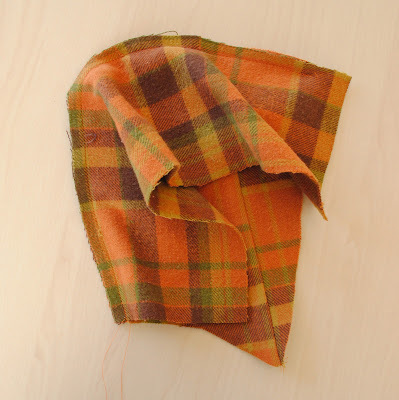 You will need to trace two separate pieces, one for the lining and the other for the outside. 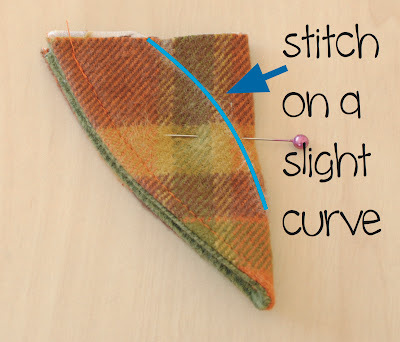 For the outside, you will need to measure 3 inches from the upper left corner edge of your pattern and draw a line from that point to the bottom left corner of the pattern as shown in the picture above. 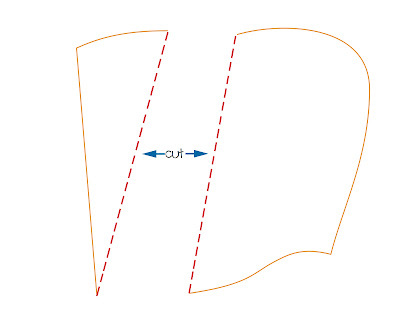 Cut along the line, creating two pieces of the hoodie pattern. 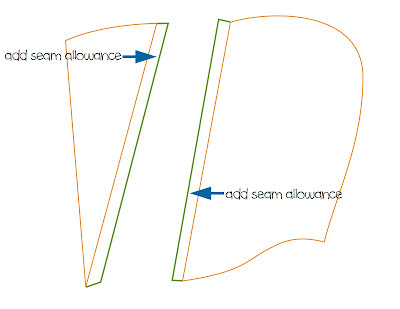 Add a seam allowance to the cut edges. 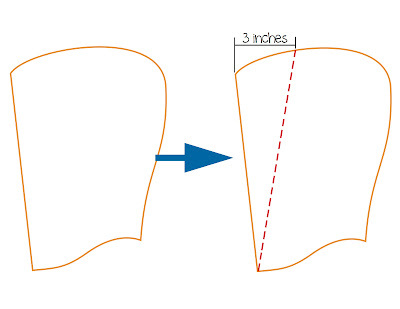 You should have one uncut hoodie pattern (for the lining) and two pieces of the hoodie pattern (for the outside). Set aside. You will need to make a pattern for the band that goes down the middle joining the two sides of the hoodie pattern together. You will need to measure the length of the band and probably the easiest way is to use a piece of twine or yarn. 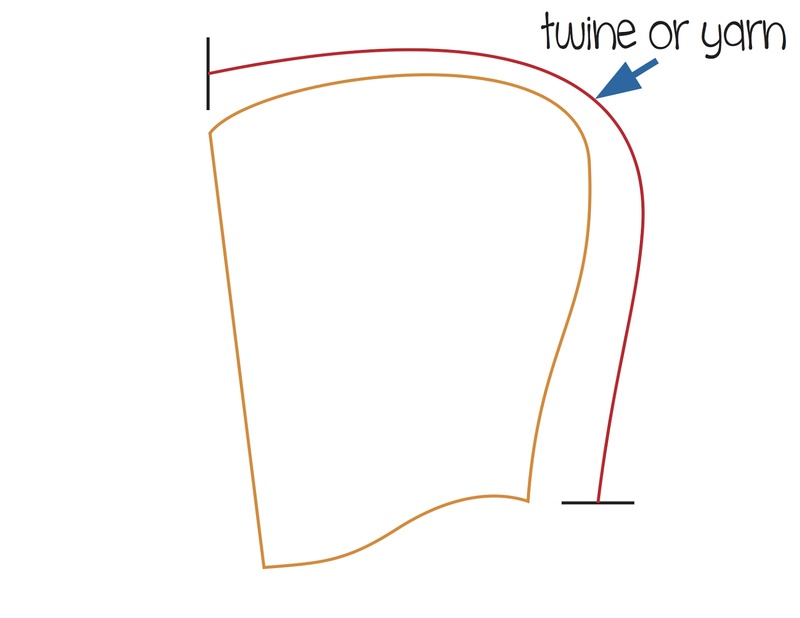 Starting at the upper left corner of the whole hoodie pattern piece, trace the curve of the pattern with the twine/yarn to the bottom right corner. 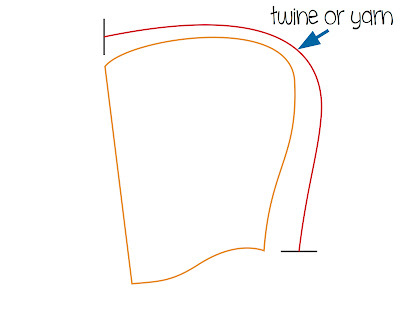 Add an extra 1/2 inch to the twine/yarn (just to be safe). Now you have the length of the band. For the width, do 4 inches. So you will cut out a rectangle piece with a measurement of 4" by whatever your twine/yarn measures. Set aside. For the ears, it's up to you what shape and size you'd like. 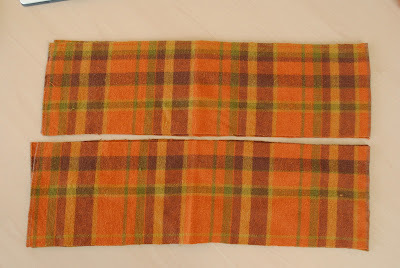 Just remember to add a seam allowance and a little extra (about 1/2") on the bottom edge. Also, make the bottom of the ears wide enough so that when you sew a dart onto it, it will be at the desired width. 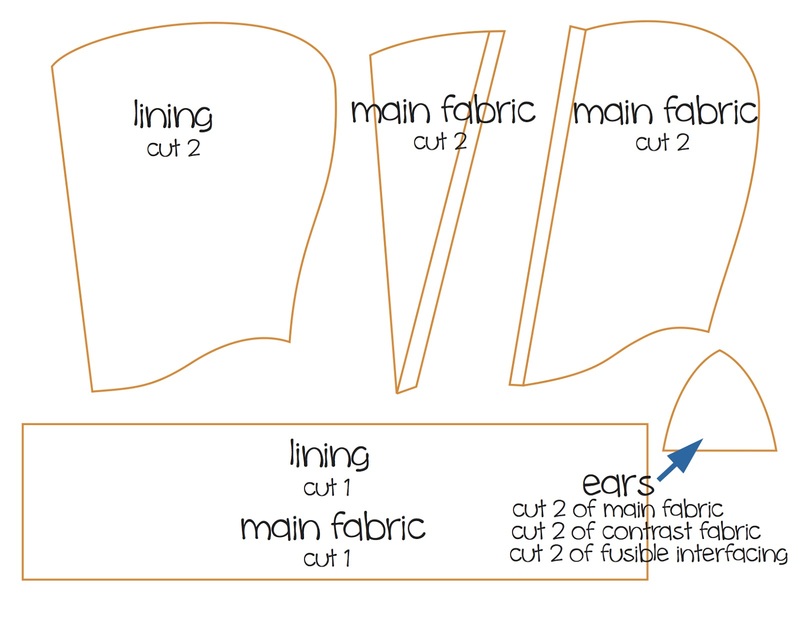 Once you have your ear pattern, band, and hoodie sides both lining and outside patterns, you are ready to cut your fabric. Your pieces should resemble the picture above. Also refer to the Diagram 1 on how many pieces of what to cut. Let's start with the ears. Following the instructions for your interfacing, fuse the interfacing to the wrong side of your main fabric. Matching the main fabric with the lining and right sides together, sew ears together leaving the bottom edge open. 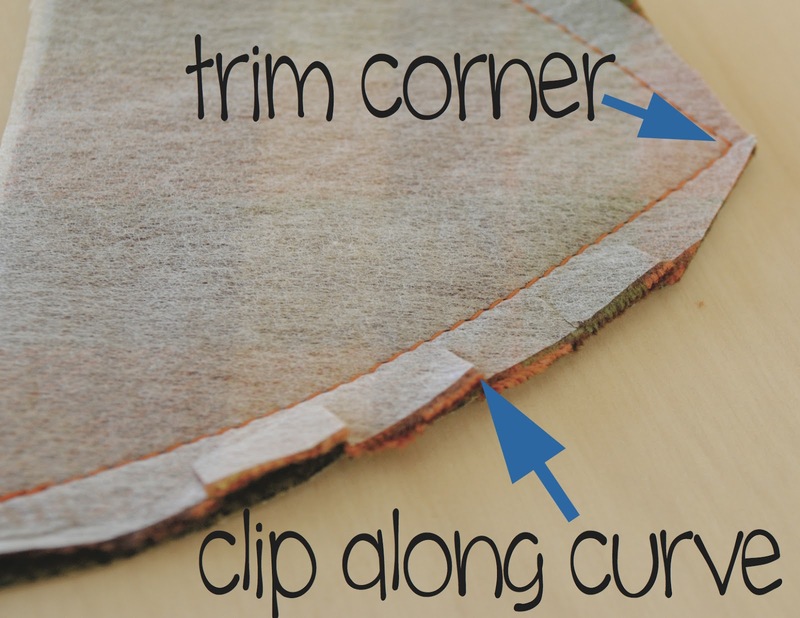 Trim the corners and clip along the curved edges. Turn right side out, iron and topstitch close to the edge of seams. Fold ear in half with main fabric on the outside. 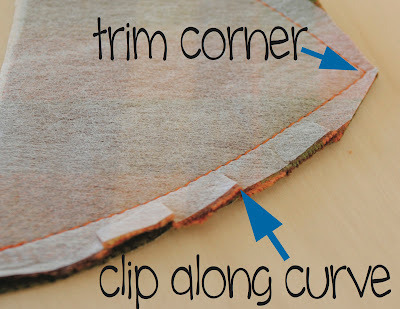 Trace a slight curve with chalk or sewing marker and stitch along curve. Back stitch to secure. Repeat for the other ear. 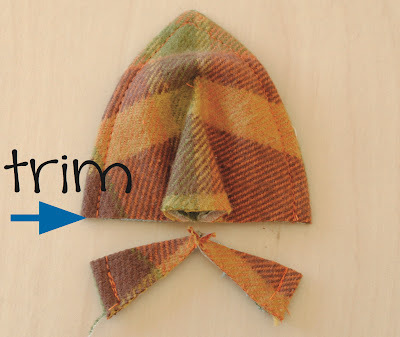 Trim the bottom edge of ears to have a straight edge. Open and flatten the back edge of dart and baste the flatten area in place. 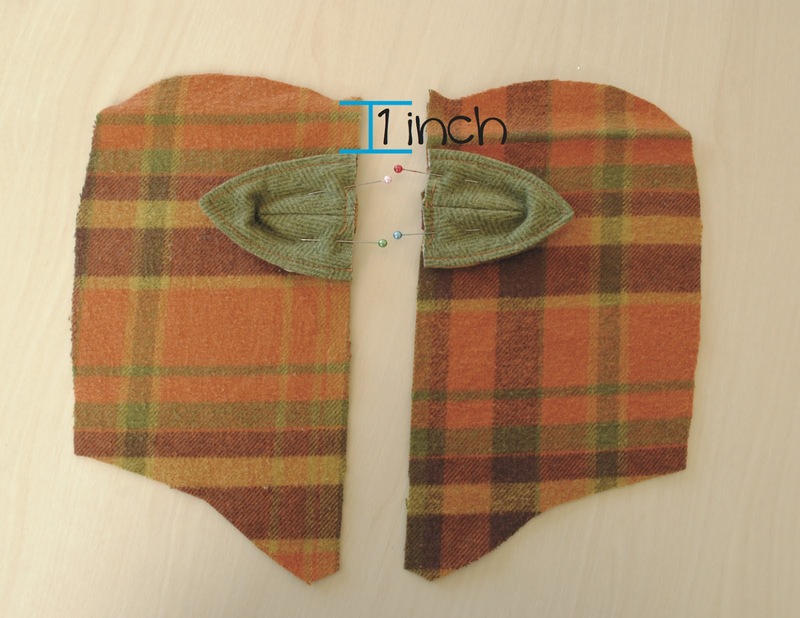 With the larger piece of the cut hoodie pattern, measure 1 inch down from upper edge and pin ears in place on right side of main fabric. Baste ears in place. With right sides together, attach the smaller piece of the hoodie pattern to the larger piece. Turn over and iron the seams, having the raw edge face backward. The outer sides should look like this. Once you joined the band with the sides, trim off any extra band fabric, set aside and do this step with the lining. 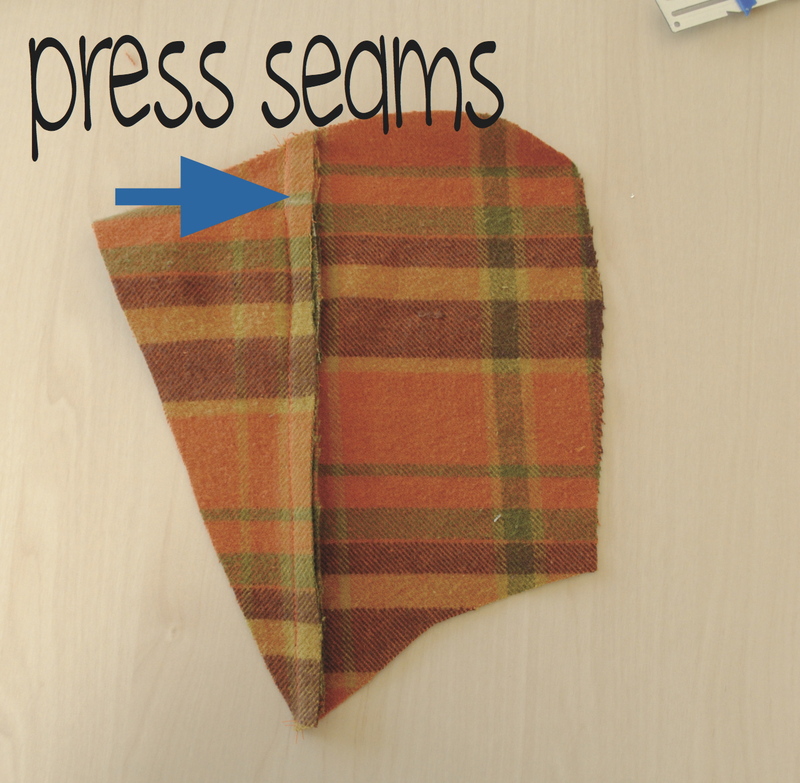 With your lining piece inside out, iron the seams facing outward. Take your outside piece and iron the seams facing inward. It's nice to have the seams pressed so come time when the two pieces are sewn together, it lays nice and flat. 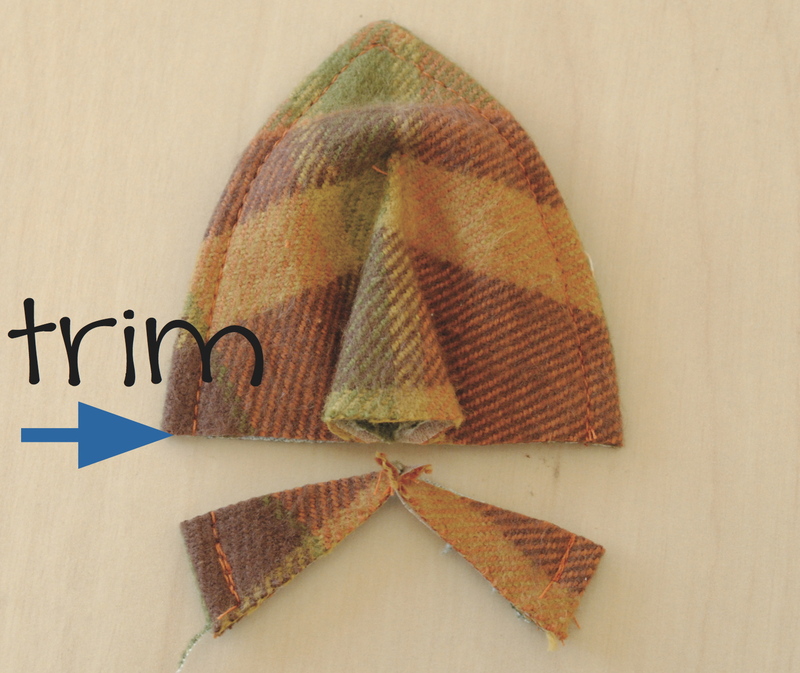 Take your two hoodie pieces and with right sides together, pin and sew along the front raw edge of the hoodie. Leave the bottom raw edge open. Turn right side out and iron seam. 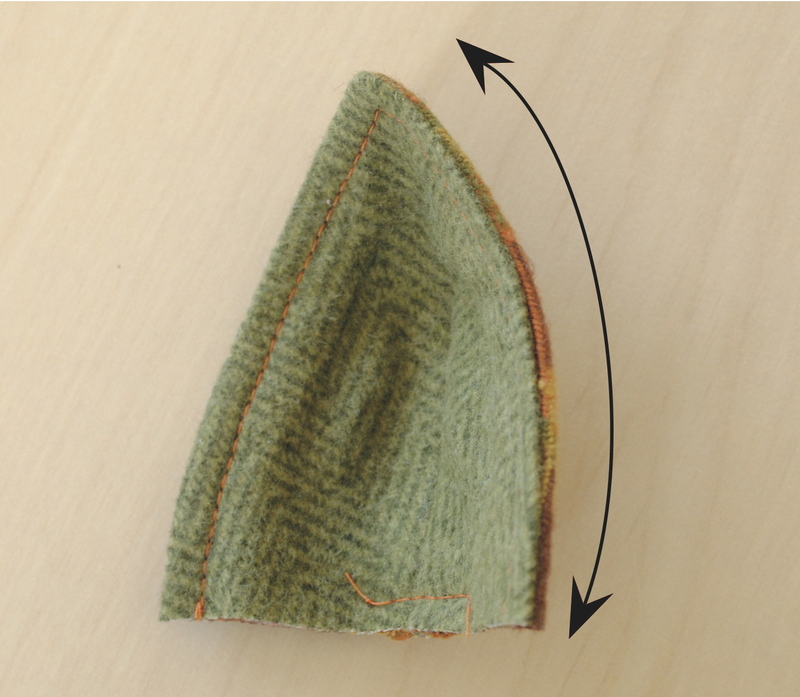 Fold along bottom edge of hoodie to find the center. Mark it and set aside. 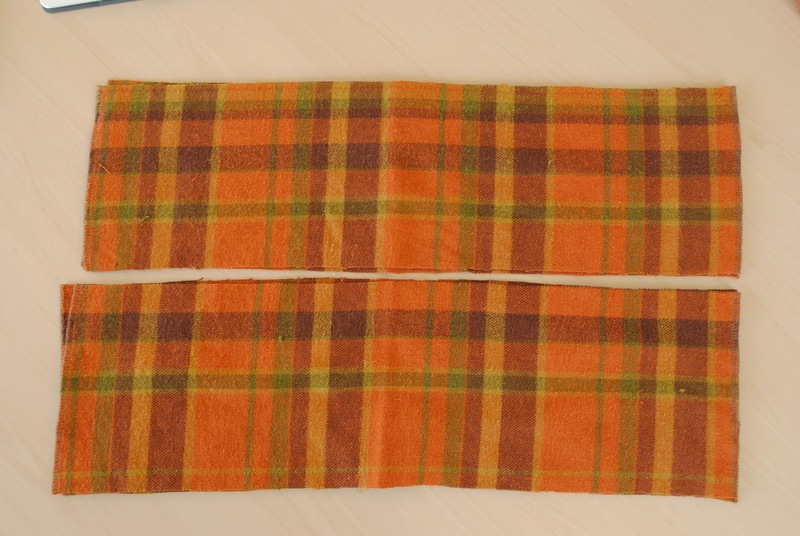 Now the scarf is a rectangular scarf. You can get fancy, but for this tutorial, we'll stick with the basic. 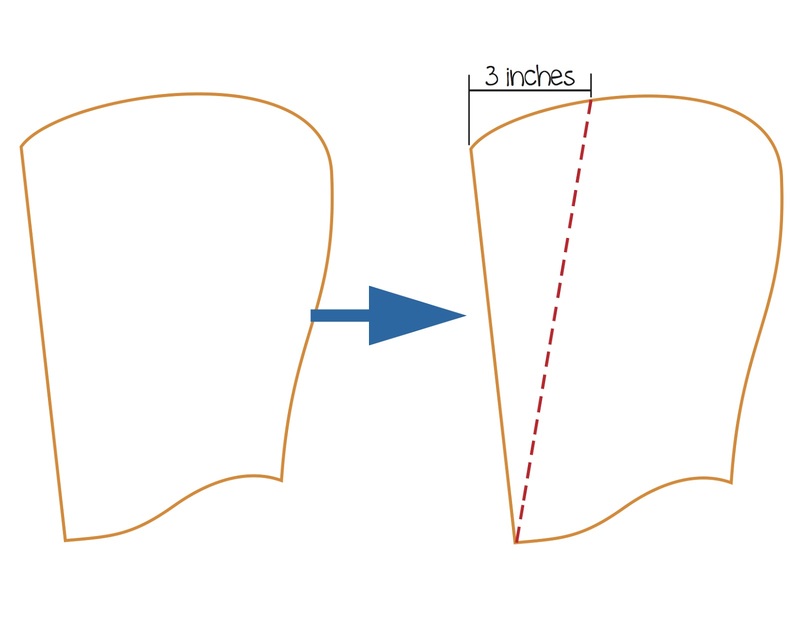 If you're sewing for a toddler, I find the dimensions of 8" x 22" to be perfect. Not too long that'll get in the way and just wide enough to cover their necks and even tuck under their coat. For older kids, it's really up to you. Also, depending on the amount of fabric you have you may need to cut two pieces for the front and two for the back and attach together to get the desired length, which is what I did here. Mark the center of the back piece of your scarf. 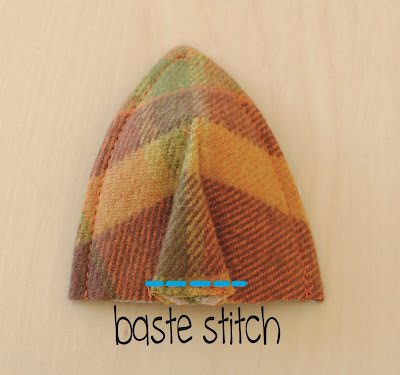 Matching the center marks of the backside of your hoodie to the backside of the scarf and having right sides together, baste in place. 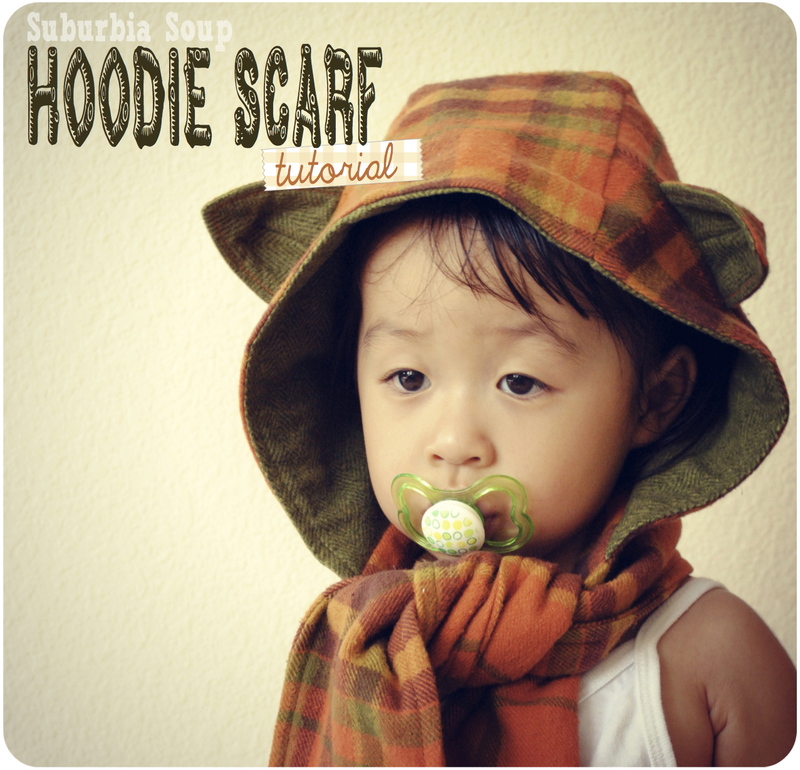 Roll your hoodie up and attach the front side of scarf with right sides together. Leave a 4 inch opening along the long edge of the scarf so that you can turn it right side out. 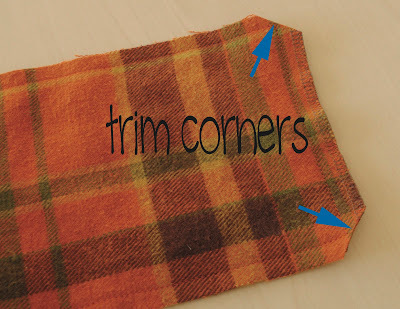 Trim corners before you turn it right side out. Iron the seams flat and topstitch about 1/4 inch along the edge of the scarf and hoodie. Now go wrangle your little animal and tie it on! I would love to see what fabulous things you make! O wow, how adorable! I shall have to study this in in-depth detail when I've the time! If you make one, I'd LOVE to see it! I can't even believe how amazing you are. I LOVE THIS!! Awww garsh... thanks!!! You gotta make one! I have to make this! Thanks for making a tutorial!!!! This is amazing! I found you through pinterest. I'm definitely going to make this for my girls . Thank you for the tutorial! Yay! Thanks for finding me! When you make one, be sure to post your fab creation! I'd love to see it. Thank you for sharing your pattern and tutorial! I found you through Pinterest and I'm really excited to make this. It would be the perfect gift for my friend's kiddos :). YAY! Thanks for finding me! They'll love it! Found you through pinterest as well. Pinned your tutorial last night and got busy this morning and made one of these for my little one. She looks so lovely in it! Thanks for the super tutorial. I usually have a hard time understanding these, but yours was simple! All of the pics made such a big difference! Thanks again. I haven't started making mine yet! thanks for the tutorial! Alright... I just made my first one (making three as gifts)! I uploaded the photos, too. It's a dinosaur hoodie/scarf and it's adorable! Although I did get stuck at the step where you baste the hoodie to the scarf. It took me awhile to realize that you needed to actually sandwich the hoodie in between the two pieces of the scarf and then baste it. I had the hoodie on top of the scarf and couldn't figure out how that could be right. And obviously I wanted to make the scarf with the pockets, but it ended up being WAY too short for it's intended recipient, whose wingspan is 38". My LO's wingspan is only 30" (she's in the pictures) and it fits her perfectly! So I guess I'll need to make another one and add about 8" to the scarf. This is probably my favorite thing I've ever made! And so easy! I cut out the pieces on Friday night, and sewed the whole thing together in one day! And that's with a 2yr old running around and only allowing me to work in fits and spurts. You did an awesome job! 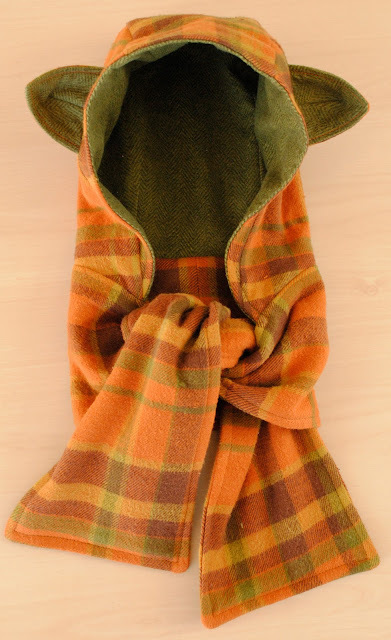 For the short hoodie scarf, you could add additional fabric to the ends to extend it. Yes, these will make perfect gifts... I know I'm making some! Thanks for sharing!!!! hi!!! 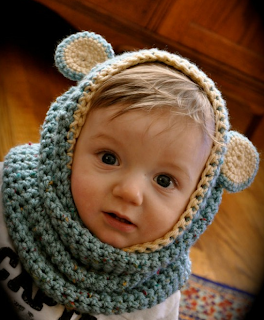 i'm the maker of that crocheted bearcowl you linked up there! i LOOOOOVE your sewn hoody...now i can't SEW to save my life but I might give this a try - sooooo cute! love it! Hi Savera! (beautiful name BTW) Thank YOU for being my inspiration! I love this! I hate hats in the winter and this would be perfect for me. I think I am going to make myself one. I can't decide whether I want the ears or not (they are so cute, but I'm not so sure I can pull it off in my 40's!). I may need to make two. Make two! One with ears and one without! :) There is no age limit... I think you can pull off! Great tutorial, I love it. You're very welcome Mallora Maria Jose! Yes! Please try it out! Thanks for visiting! actually i made my own version of it.. Thank you so much for sharing! I would love to make one whenever I get the time. :) So cute! Your little one will look sooo cute in one! Thank you for the tutorial, the school where my son goes was asking for donations specific hats and scarves to donate to a hospital,I was so lucky and happy to found this tutorial I'm going to try to make at least 6, I made one so far it took me a long time but I think the first one will be the hardest one, I know I can go to the store and buy them but I feel really good using my sewing for a good cause. This is awesome! I'm so happy you found my tutorial. I would LOVE to see your creations... please post pics and let me know if you have any questions. Hi Shannon! Yay! I'd love to see it. Kitty... bear... they're all cute!!! Shannon, this is wonderful!!! Awesome job! You're so welcome... please send me a pic of your giraffe when you're done. I'd love to see it!!! Wonderful tutorial! Excellent directions. Thanks you for sharing your talent!! What a great tutorial! Love it! I found you through Sew Can She. Thank you for sharing! Hi! Yes, I used flannel on both inside and out. You even use fleece for the lining. It did a decent job blocking the wind, but if you're wanting something to keep her really cozy, use fleece. Enjoy and I'd LOVE to see your creations!!! It's 103 here today but I still can't wait to get started on one of these! Thanks for the inspiration. I'm just finishing it, thanks a lot for this tutorial. and thanks to commenter churrl, without her explication i'd have tough time to finish the scarf! Woohoo! Thanks, Katarina for trying it out! I have a revised version of the hoodie scarf and will have a tutorial soon. In the meantime, I'd love to see what you made! Wow! I LOVE THIS! I am running out tomorrow to pick up some fabric for my three daughters! Perfect, affordable, Christmas gifts is what I see! :) Can't wait! Thanks so much! Really fabulous. I hope I will take the time to make one!!! Venus hello, I liked and make one for each of my nephews (10, 7, 3 years) but they live far away - in another country, and I do not have hoodies for the pattern. Can you help me, please ! !